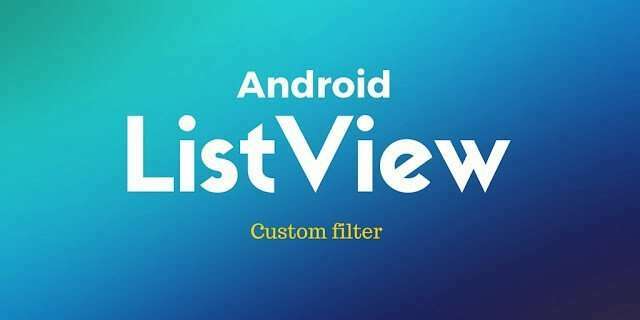 This post describes how to use Android Listview custom filter. In the previous post we showed the way we can programming a custom adapter and a custom layout. One aspect we didn’t cover by now, is how we can filter the items in the ListView. In this post we describe how we can develop an android listview custom filter to filter items inside a ListView while the user writes words inside an input field. We can use the example shown in the last post and modify it. What do we need to do it? If we didn’t use a custom adapter witha custom object inside the ListView, the things would be much easier. For example, if we used just String as item content we simply could add a few lines of code to make our list filterable; but we have a custom layout that uses not a simple String but a complex object (i.e. Planet). So we need first modify our custom adapter (PlanetAdapter) so that it implements the android.widget.Filter interface. This interface requires we implement just only one method called getFilter() that returns a android.widget.Filter object. The problem is the way we can create this filter. Very easy! Let’s suppose we want to filter the planet list using the name attribute. In our case, then, the constraint can be the initial letters of the planet name, so that if the planet starts with those letters we show it otherwise we hide it. In other words all the list. If the constraints aren’t null or empty we simply select the planet with its name starting with the constraint, as shown below. The next step is publishing the result. This is code is quite trivial, we simply invalidate the result set if the result list is empty or we notify that the result set is changed. In the main activity, we have to add some listener attached to EditText so that when user writes inside it we can filter the list items. If I press "a" and delete.. repeat it very fast.. the app closes.. ListView need to be notified, that's the error message. But how to notify it again ? or how to avoid this bug ? Thanks for you comment. I will try to reproduce this bug and fix it and i will release a new source code version. I tried to reproduce the error you told me…but even if i tried very fast with "a" and delete it the app didn't crash. I used 4.0.3 emulator. The only one bug i found is that the code doesn't show the complete list after you delete the filter in the edit view. This is caused by a mistake in the source code. You should create a copy of the original array showed in the listView and when the filter is empty set the value to this copy array. If you can repeat the error please send me the stack trace so i can have some clues. Ok, I understand the error message, but I tried to notify adapter in others ways but doesnt work. Could I add you in facebook, gtalk or g+. And I could send my codes. My app is https://play.google.com/store/apps/details?id=com.edersonschmidt.portobus you might test this issue in "Bus Lines", you could type any char and delete faster.. I changed the way how I implement this filter. but this error still reproduce. Idk why..
You can find me in g+ with survivingwithandroid. My email add is [email protected]. Btw i downloaded your app and it looks great and i didn't find the error even if i filtered the list in the bus line option very very fast (I'm using Gingerbread). Anyway if you like you can send me the code so i can have an idea more detailed. The error seems caused by the fact you try to update the view from an external thread in that case you should somehow implements something like a queue. I'd really like to investigate more about it. I am using custom list Adapter in code.The listview is having indexbar.I need to show items whose words start with letters entered in searchbox i.e. if item is having 3 words and second word start with A and we enter A in searchbox then that item also should get searched. The filter works comparing the first letter so if you entered a letter that doens't match any items the result is empty. In a few hours i will add to github the entire source code so if you are patient you can try again. Ok; Thank you very much. and remove it from the method. Since you are populating your list using a JSON URL it could be wise to use an async adapter. It could be that your list isnt still populated when you filter it. I suggest to you to try with a "static" items and verify that everything works then you move on and try to populate the list using JSON. It could be useful to verify if item ids are stable there's a method to verify it. Anyway i will try to set up an example code that populates the list using a JSON and i will verify the result. Reading your code it seems everything is fine so the only one thing that is different from my example is the JSON URL. Ok,thank you veru much ,I try with autocompletetextview and that's not working too. Hi, code provided by you has been a great help while working on filtering custom list. Could you please also tell how to get back the names in the list as the user deletes characters in the search bar to return to the actual list. thanks for this great tutorial but where did you post the solution? Great Tutorial. Well explained. I used your code from Github and it filters my list fine. However, when I select a listItem it only shows me the first item in the list , even if it that item was filtered out. I am using onListItemClick, where you use onItemClick. I'm populating my list from SQLite database and using Parcelable to send the data from the listview to a detail view. This is a project that's due in next week so a reply would be real nice. Thanks. If i get correctly when you use a filtered list and select one item of this list you get always the first one. If so i think you are using the original arraylist instead of the filtered array. Thanks for the reply and hope to hear from you…. 2. You get the bird information from original birds list and not from the filtered one. So you should ask to the adapter the new birds array (the filtered one) and then get the bird data from it. Great, Thanks. I'll give it a go now. This is my first app and I'm just getting used to Android. Ciao, ho provato il codice da gitHub e funziona. Ma applicandolo al mio progetto, in cui ho implementato una mia versione di "Pianeta", il filtro non funziona. Il mio codice per la lista è basato sul custom adapter del tuo esempio "SimpleList". Non riesco a capire cosa può essere. In pratica quello che scrivo nell' EditText viene ignorato. Ho controllato tutto più volte… Qualche idea? ciao e grazie comunque per gli ottimi tutorial. Adesso provo a scaricare il tuo progetto per vedere se riesco a capire xchè il filtro non va.
Grazie mille! non potevo sperare in niente di meglio. Per la miseria funziona pure sul cellulare! Non ho toccato il codice, ho solo disinstallato la versione con la firma di Eclipse del portatile, e installato la versione dal desktop. Ieri ho perso una giornata… boh. I found a solution on how to refer to the filtered list. Ho risolto su come fare riferimento alla lista filtrata. and also made the search widget… but how do i get edit text like id from it because search widget don't have any method as addTextChangedListener i suppose..
but I am unable to make it through… can you help ? Hey, nice tutorial. Whenever my list has no matches, and nPlanetList is empty, it shows everything. How can I change it to show nothing? Listview not updating after filtering..
"mOriginalValues" in the above example is used to store original items. Thanks for this tutorial. Is there anywhere to get the source code for this tutorial? Dear Ravi, getFilter() isn’t working, even toast outputs. Dear Ravi, getFilter() isn't working, even toast outputs. because I had such a problem and I tried resolving it with checking the position in the getView function, which eventually led for listiView to no get updated. which is add the getCount method so the adapter can use it after filtering and data set changes. Best tutorial for filters in a listview. Thank you very much.